1 Blend the garlic, parsley and butter together. 2 Use a sharp knife to cut a deep pocket inside the chicken breast-take care not to cut all the way through. 3 Mix the Knorr Reduced Salt Granules with the flour to season and mix the breadcrumbs with the Parmesan cheese. Place the seasoned flour, breadcrumbs and beaten egg onto three plates. 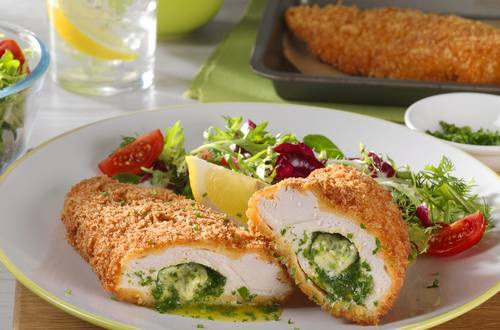 4 Place a tablespoon of the garlic and parsley butter into the centre of the chicken breast and flatten it with your hands to seal. 5 Dust in the seasoned flour, then in the egg mixture and coat with the breadcrumbs. Repeat the process to ensure a good coating to help prevent the butter from leaking out. 6 Chill in the fridge for 50 minutes to 1 hour. 7 Heat a frying pan with vegetable oil to a depth of 2cm and add the chicken. Cook for 10 minutes on each side. Remove from the oil and drain on kitchen paper. Serve immediately with wedges of lemon. 8 N.B. Take care when cooking this dish. Never leave a hot frying pan unattended and be careful of being splattered with oil.